If you were to catch the end of any conversation I have with my family, you would hear the above dialogue. Various Christians will recognize the basic structure of this statement… it is a standard salutation among the fold. But with one major difference… “the Lord” has been substituted with “the Force”. For some Christians such a syncretistic blending of religion and popular culture is tantamount to blasphemy but for my family, and judging from this meme many other people, this blending is par for the course. One need only Google ‘Star Wars and Religion’ to be barraged by the plethora of books, articles, websites dedicated to this topic. There are not only laymen and scholars who champion Star Wars as something more than popular culture, there are Jedi Churches in many English speaking countries and Jediism is, according to a 2001 Census, Jediism is the 4th largest religion in the U.K.
Jediism is a modern religion which was born as the result of the Star Wars mythology. George Lucas, when he created the Star Wars saga, used various aspects of Taoism, Shintoism, Buddhism, Christianity, Mysticism, and many other religious universal truths as well as a combination of different martial arts and the code of chivalry, in order to create the Jedi and the philosophies behind the Force. The Jedi are modern versions of the Shao Lin Monk, the European Knight, and the Samurai warrior all mixed together. The Jedi path has become an inspiration and way of life for many people throughout the world who take on the mantle of the Jedi. Even though Jediism is a new faith, it is just as real as the ancient faiths and philosophies that it came from… (From The Temple of the Jedi Force website). So maybe you aren’t buying that idea that Jediism is a ‘real’ religion… but let me use this moment to explore a perennial question in religious studies, what exactly is ‘religion’? In our times, “I’m spiritual by not religious” is a common expression… one which did not exist a century ago. This suggests we might be more comfortable with ‘spirituality’ being unanchored from institutional foundations than we have ever been. We might ask why some ideologies count as full-fledged religions (and receive all the accompanying privileges and protections) and others are dismissed as purely cultural manifestations of popular sentiment. Or, maybe a better question is whose ideologies count as full-fledged religions and why? I am not proselytizing for the Temple of the Jedi Force or Jediism in general. I am actually using this striking example to illuminate some problems in the category of religion. While many academics argue over disciplinary distinctions, the most divisive ideological battles within the academic study of religion, I have found, are over the most basic questions. The moment the ontological query is posed in regard to religion, ‘what is IT?’; all proverbial hell breaks loose. You might call it a battle of cosmic proportions… and one in which many participants come to their ‘objective’ conclusions long before the first light saber is drawn. And why might this be the case? Religion, as a topic, love it or hate, or dismiss it, is for a majority of the human population a ‘given’ and yet ask a handful of individuals in that same majority to define religion and you will be met with a myriad of definitions and interpretations. 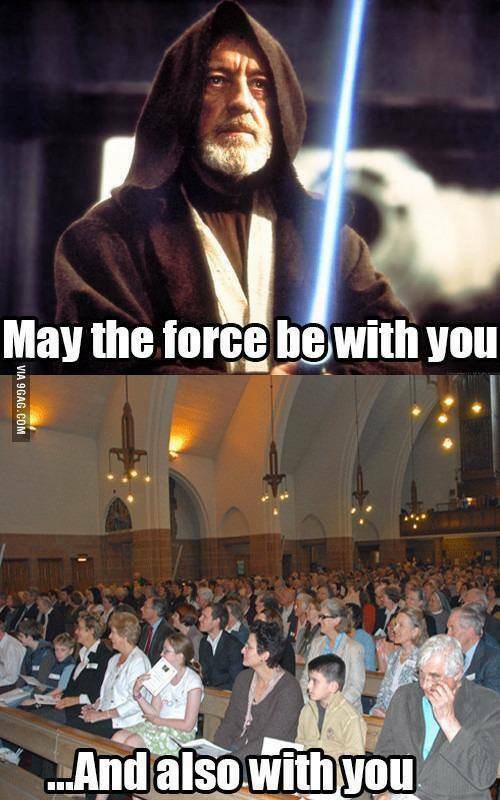 Question: Is Star Wars religious? 1. What does the creator say about the ‘religious’ aspects of the series? The following statements were made by Lucas in an interview with Bill Moyers for Time magazine in 1999. So Star Wars according to its originator is not inherently religious. Okay, so that is settled… and yet Lucas goes on to say that he purposely put the Force into the films “in order to try to awaken a certain kind of spirituality in young people—more a belief in God than a belief in any particular religious system.” So, per Lucas, we have myth, mystery, and God but no specific religious system. Notice that Lucas does not mention a god or gods but God… if he is invoking the so called God of Abraham here, then I would argue is he is pointing to a particular religious system whether he is aware of this or not. 2. According to Christian Theologian John C. McDowell at the University of Edinburgh, in his article ‘Feeling the Force- Star Wars and Spiritual Truth’ from bethinking.org, there is a link between Lucas’ Force and a Christian view of God. Obi-Wan’s teaching that the Force ‘surrounds us, penetrates us, it binds the galaxy together ‘(ANH) strikingly evokes Pauline imagery of ‘one God and Father of all, who is over all and through all and in all. While this connection may be too tenuous for most readers, McDowell presents this interpretation as just that… an interpretation. A more exclusivist rendering of Star War’s ‘true message’ comes from our next author. The Force itself is too abstract and impersonal to equate with the biblical God and is more readily indentifable with concepts in Eastern religions (Lucas came to describe himself as a “Buddhist Methodist”). To become fixated on the story alone or to use it for a particular agenda- such as trying to create a Jedi religion and have that included in census data or claim ownership of the franchise direction/ meaning- is to ignore the message of ‘Star Wars’ itself. So, what is your conclusion? Have these varying answers clarified anything for you about the true meaning (religious or not) of Star Wars? Is it just a story? A modern epic embodiment of the eternal cosmic war between good and evil? An updated repackaging of Joseph Campbell’s archetypal Hero Myth? The celluloid settling of a real and true religious tradition as the Temple of the Jedi would have us believe? What is going on here? Is Star Wars truly a postmodern enigma that defies definition or is there something else complicating our investigation? All of these answers assume one thing… that we all agree on what religion inherently is… notice none of these explanations tell us what makes something religious/sacred/transcendent, or not, they simply assume our definition mimics theirs, and then proceed to enumerate the ways in which Star Wars is or is not religious/sacred/transcendent. So what have these descriptions provided us with? Maybe not with a clear distinction of the religious nature of Star Wars but rather an intriguing glimpse to what these authors deem religious. For an excellent article on Jediism, read this piece, while other fascinating examples of Star Wars and religion may be found here and here. I'm a PhD student at Oxford Brookes University researching female melancholia in Early Modern medicine, drama, and its resonances with our understanding of female depression today. I also have research interests in Shakespeare, Renaissance literature, Children's Literature, CS Lewis, and The Inklings. This entry was posted in Relationship Status, Tales of Star Wars Fans, Themes and Influences in Star Wars and tagged Bible, Buddhism, Catholicism, Christianity, George Lucas, Guest blogger, Jediism, Religion, Star Wars, Taoism. Bookmark the permalink. This piece is fascinating thank you for drawing my attention to it – I look forward to the book and if you’d like to write a post for the site you would of course be welcome. Wake up, it’s the force folks!